The Sani-Tech Systems Inc. Rotary Bottle Buster and Screw Conveyor is designed to remove liquid from a variety of containers in a very efficient manner. This machine is designed for Recycling Aluminum Cans, Recycling PET Containers and processing a host of other containers. A powerful, electrically driven drum shreds and destroys the container. The liquid drains out the bottom, while the container is conveyed to a baler or alternate container. Fast: The Bottle Buster will process material as fast as it can be thrown in. It can process 200-300 HDPE containers per minute and 1600-2400 16 oz PET container per minute. Clean: The system is completely sealed to prevent liquid and material spillage. Drain systems on the Bottle Buster are used to reclaim liquid or send it to waste. Flushing sytems keep screens and drain systems clear. Reclaimation: When used with the Screw Conveyor, the empty material is tumbled up the conveyor, removing liquid remnants even further. If used with a compaction container, a drain system on the container will allow any fluid to drain. Versatile: The Rotary Bottle Buster can process a wide variety of containers without adjustment. It is available in 5, 10, and 15 HP and 24" or 36" drum sizes. 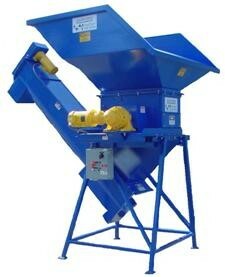 The Bottle Buster and Screw Conveyor can be designed with many hopper and feed options. The screw conveyor can also be modified in regard to length and height. Valuable: The Rotary Bottle Buster substantially reduces labor and hauling costs related to product destruction or reclaimation. Hopper Feed Options, 5, 10, 15 HP Options, Custom Wiring to Conveyor Systems, Custom Colors, Odor / Insect Control, Photo Eye Start Switch.